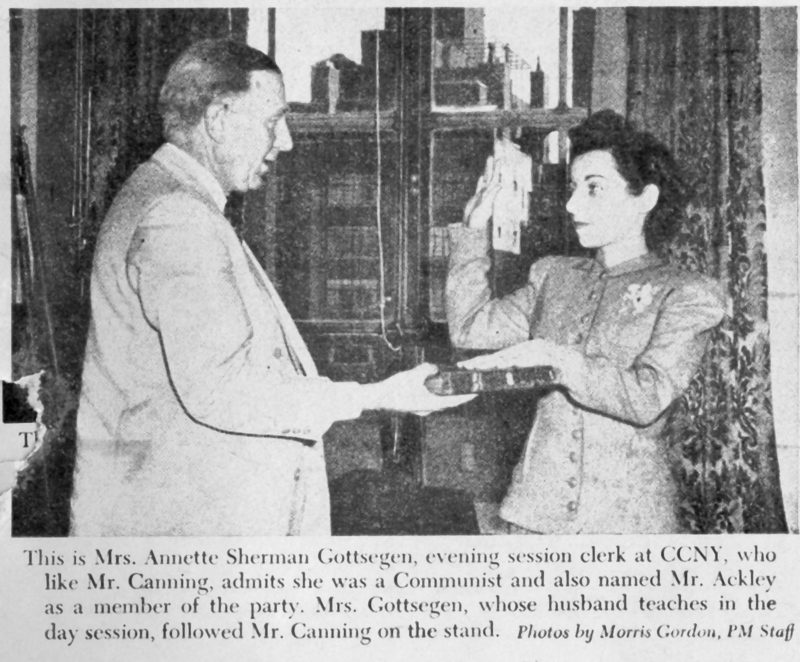 This photograph shows Annette Sherman Gottsegen, a clerk at City College, taking an oath prior to her testimony against CCNY registrar John Ackley. Ackley would shortly thereafter be fired from his position. Gottsegen had previously been a member of the Communist Party and an active participant in the Teachers Union and the college's Anti-Fascist Association. She used her experiences with the various groups to testify against those she observed at the meetings. Gottsegen's testimony was prompted by the Rapp-Coudert Committee, a state run investigative group that subpoenaed and interrogated more than 500 faculty, staff, and students from New York's public schools and colleges between 1940 and 1942 in their quest to identify subversive influences on campuses. Particularly interested in those with Communist ties, City College became a special target of the committee with dozens of its faculty and staff called to private and public hearings. Cite This document | Gordon, Morris, “Annette Gottsegen Taking Oath Before Testimony ,” CUNY Digital History Archive, accessed April 23, 2019, http://cdha.cuny.edu/items/show/3842.